Another example in the increasingly annoying series of … no, not “Nicolas Cage embarrassments” this time, he is surprisingly low key. But the series of “if it’s based on a true story, it promises to be somewhat boring”. 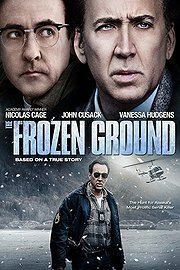 If they would have just taken the case of a serial killer based on the rather scenic background of Alaska, and a State Trooper who (just in the last days before retiring from the job, mind you…) sets his mind to catching the bad guy, trying to identify the pattern behind all this… this could have been a nice addition to that particular sub-genre. However, as the reality behind the plot dictated (I suppose), we have to endure the frustration of a Trooper who kind of knows exactly who the perpetrator is, but who just cannot find enough evidence to arrest him while that guy (John Cusack, by the way, who seems to have seen better times in his career) just denies all allegations. Is it a cat-and-mouse game that keeps the audience on edge? No, it is just that: a rather frustrating experience, without any particular tension. At some point all is resolved somehow, but even that moment of resolution is a bit arbitrary, as if the authors were desperately looking for some plot device that could bring a Hollywood twist into the whole affair.